In this lesson, you will be learning to use a DC gearhead motor, a power transistor, a diode, and a resistor in a complete circuit that controls the speed of the motor. Using software code, you will learn to instruct your Stamp to turn the motor off and on fast enough to act as a motor speed control. 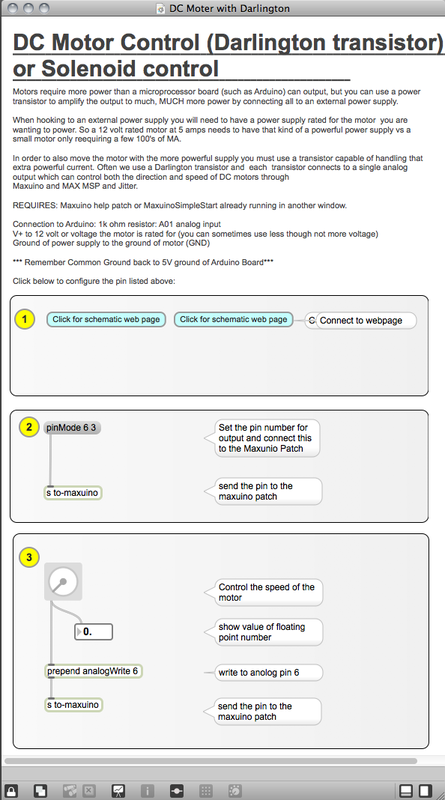 After programming the motor to move, you will use the same circuit with a PIR sensor to activate the motors in response to your infrared heat signature. The DC gearhead motor is one of the best ways to create motion in your work. You can utilize the circular abilities of a DC motor to spin a gear or object. You can also use motors with cams to turn a circular motion into a linear motion. DC gearhead motors consist of two parts: a fast turning motor and a speed-reducing gearbox attached to the shaft in the front of the motor. This gears the motor down so the shaft will turn much slower. It also significantly increases the torque that the motor can provide. Common DC gearhead motor. 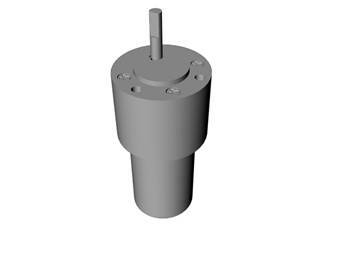 The motor is the smaller circumference element at the bottom and the gearbox is closest to the shaft. Common DC motor voltages are 1.5--12 volts, but there are 24-volt models, as well as up to 1000s of volts also available. Generally, the larger the motor the more current it will consume in running. It is important to think about the power source for the motor. 1.5--24-volt power supplies are quite common, but as they exceed 24 volts, the cost of power supplies increases and, therefore, it is sometimes best to stay in the 1.5--24-volt range. 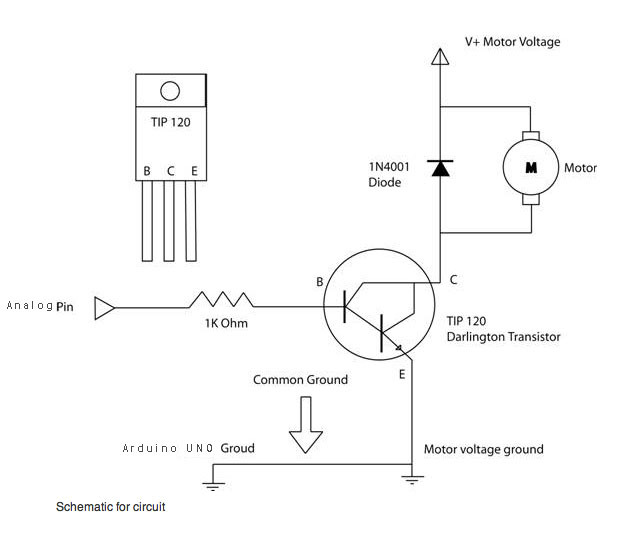 The Darlington transistor (TIP 120) is designed as a medium power-switching transistor and can be used to switch a motor on and off. As discussed in Chapter 5, the transistor can use a small current to switch and amplify a much larger current. Transistors, like most semiconducting parts, have absolute maximum ratings. 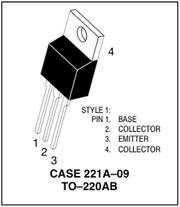 The controlling pin on the transistor, or base, is sensitive to too much current, so you must have a 1k-ohm resistor coming from the output pin of your microcontroller into the TIP 120. The maximum voltage that the TIP 120 can switch 60 volts DC at 8 amps when pulsing and 5 amps when not pulsing. This transistor, coupled with a motor power supply, will allow you to run DC motors and empower you to activate many other devices like solenoids (linear motors) and other inductive loads like more powerful relays. Other common Darlington transistors are the TIP 122 that can switch 100 volts and the TIP 121 that can switch up to 80 volts DC. The pin arrangements of these three transistors are identical.